Pic from Gibson's movie: "The Passion of the Christ." such as religious leaders of today. Gospel of John Question: Why wasn't John the Baptist accepted and received by the religious leaders of his day? and urging the people to repent of their sins. 24 Now those who were sent were from the Pharisees. 25 And they asked him, saying, “Why then do you baptize if you are not the Christ, nor Elijah, nor the Prophet?” 26 John answered them, saying, “I baptize with water, but there stands One among you whom you do not know. 27 It is He who, coming after me, is preferred before me, whose sandal strap I am not worthy to loose.” 28 These things were done in Bethabara beyond the Jordan, where John was baptizing. John 8:47 - "He who is of God hears God’s words; therefore you do not hear, because you are not of God.” Note - Read the context: John 8:1f - (the whole chapter). 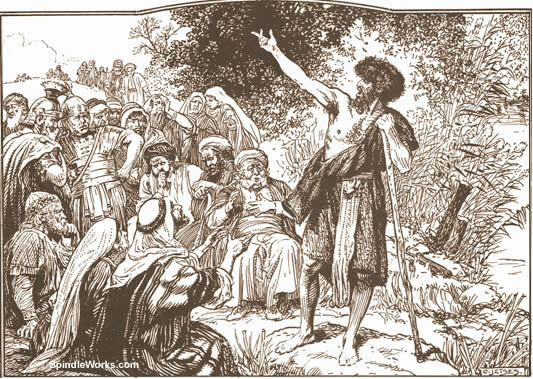 4 - The established religious order did not conceive of the type of Messiah which John the Baptist was conveying. They did not conceive of God's promised One - The Messiah, as a suffering and dying servant for the world's sins [Isaiah 53:1f]; but rather as an earthy Monarch who would politically free them from their Roman colonial overseers. Christian friends and those of you unregenerate (still searching) - Today, is no different. God's prophets are considered by the religious world as the scum of the earth. Like John the Baptist of Jesus day, God's messenger prophets are not what is expected by most people. God's prophet messengers are different. They often speak words and messages which are perceived and considered hard and harsh. They often do not care for religious humdrum; for the prescribed and legalistic religious order of the day; nor, for the political correctness of church and secular culture. Some church bodies (organizations) and their perspective leaders will theoretically accept the reality of God's prophets still being in operational form in our day and age. They will give that lip service impression to their devoted following; mentioning that certain Scriptures contain that reality. [Romans 12:3-8 ; specifically Romans 12:6] But, these same church bodies and their leaders are as spiritually blind as the Pharisees were in John the Baptist's day, when confronted by God's prophets. They conveniently either do not recognize God's prophets from the past (Hebrews 13:7) and / or they dis those prophets of God sent to them (in present time) who have come in the Name of the Lord to help curb their errant beliefs and practices; and thus, assist them to be lead into God's truth. [Matthew 10:41 ; Mark 6:11 ; Luke 9:48.] These church bodies (and accompanying leaders) will even vilify God's prophets and seek to harm them in various ways. 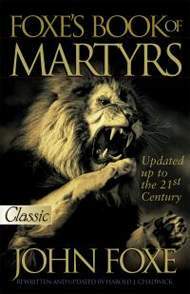 Please Note: The New Testament Book of Acts 1:1f ; also read Fox's Book of Martyrs. As in John the Baptist's day, the religious leaders allowed the message of John to go in one ear and out the other by focusing on who John the Baptist [was]. No prophet of God is without sin (except Christ, during his prophet ministry here on earth). But, it is damnable human nature to tune out and reject the message of the prophet, by going about the nefarious actions of character assassination. When the character assassination focus is primarily driven toward the prophet messenger, the message becomes of no effect in the intended hearer who needs desperately to listen to God's proclaimed Scripture Word and its practical applications. Please notice: The above verses quoted out of the King James Version. However, by placing your computer cursor over the Bible reference; you may read each individual verse in the New King James Version [translation]. The Christian Message website's, "Bible Questions and Answers" are intended to help assist the web reader to appreciate the Holy Scriptures and to enhance understanding. It is this web author's prayer that God the Holy Spirit will utilize this humble effort to effect and affect faith in those who read and hear. As Pastor emeritus Nathan Bickel has additional thoughts to convey of these specific Bible questions and answers individual published web postings, he will continue to edit - revise and add. Please check back, at will on this website; and / or check with Nathan M. Bickel ['s] Facebook page: The Christian Message for notifications of this website's new additions.